@ ProxDude33:I am making more buildings.A house with multi colored roofs?what do you mean? 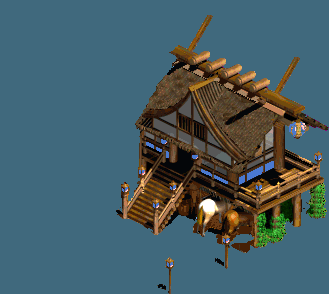 This Asian Building by Shyam Prasad is an excellent cut and paste mod which you can use enhance your Asian themed scenarios to add more eye-candy and atmosphere. For a cut and paste job the quality is very good. I've done my fair share of cutting and paste designs and none of them come close to the quality of this design. The building is also designed in such a way that it can be used for numerous thing. When I first look at it I think of using it as a tavern or an inn, due to the horse outside. But as the author states, it can be used as a House or a Mission Post,etc. However there seem to be no instructions placed within the download. If there is someone new to downloading Mods packs and didn't know what to do with SLP files, then they would be stuck. You should include a simple readme to teach people how to use the Mod and what to do with the SLP file, etc. I also don't think its worth using this Mod just to add one building. It doesn't really effect the atmosphere just to change one building. It's much better to use alongside numerous other Asian themed mod packs to increase the atmosphere of your Asian styled scenarios. Overall this Mod Pack is of excellent quality, especially for a cut and paste job. I strongly recommend downloading this mod pack if you're looking to enhance the mood and atmosphere of your Asian Themed Scenarios.